The Kentucky Center for African American Heritage, KCAAH, unveiled the Colonel Charles Young Veterans Flag Memorial in the City of Louisville on Veterans Day. The memorial was conceived by the Louisville chapter of the National Association of Black Veterans as an expression of patriotism. I attended by the invitation of KCAAH to offer a few words in support of the program. The museum has done an outstanding job in setting up a wall display to highlight the different stages of the Colonel life. The Heritage Center is the premier Black Cultural Center in the State of Kentucky. It is only fitting that Colonel Young, son of the state has a presence in the institution. After the program, we proceeded outside for the Flag raising ceremony. The project is most impressive. Entering the promenade leading to the flags are displays of the services logos on pillars entering the structure. However, in its splendor the display appeared incomplete. There was no markings or flag to identify the Soldier for whom the memorial was named, Colonel Charles Young or the regiment that he served, the 9th Cavalry Regiment. The Coalition has stepped up to remedy that matter by offering the Heritage Center a Regiment flag and marker design for the promenade. The face of the Coalition’s Challenge Coin will serve as the Colonel’s marker. Keep your eyes on Kentucky. The State is moving forward in developing itself in the area of educational tourism. The Coalition has requested that the State lend a larger hand by promoting the Colonel to Brigadier General in the Kentucky Militia. The verdict is still out on that request. The Coalition’s initial involvement in Kentucky came at the invitation of the late Doctor Jerry Gore and then Judge/ Executive James “Buddy” Gallenstein. The invite was to survey an old cabin built in the 1790’s where Colonel Charles Young was born in 1864. At the time the structure was on its last leg. One wall had imploded and with the winter setting in, it was doubtful how much more the structure could withstand. We joined and succeeded in saving the historic structure, however, the concept has grown in scope. The cabin is but a part of the historical treasures of Kentucky and the Region. We are interacting with the Kentucky Tourism, Arts and Heritage Cabinet and the Mason County Advisory Committee, chaired by Judge/Executive Joe Pfeffer in seeking the inclusion of the cabin and other related projects into the State’s tourism marketing plan. 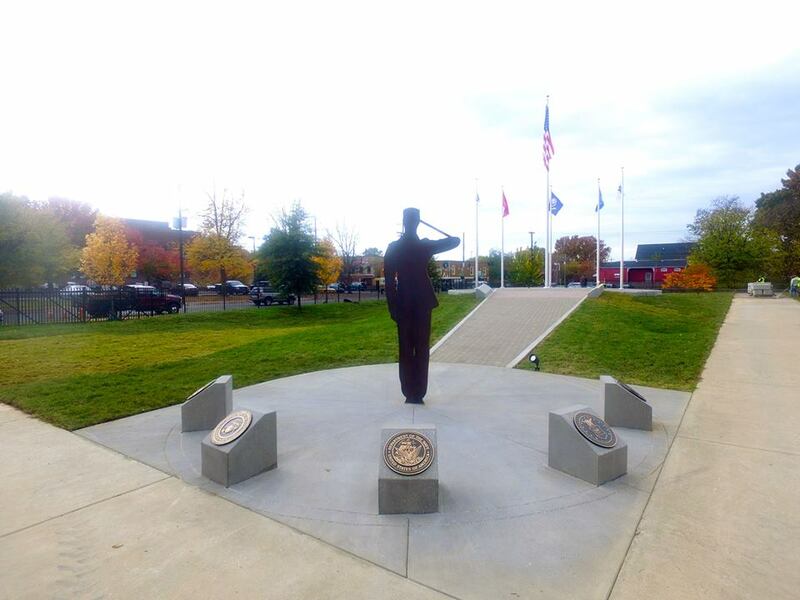 Colonel Charles Young Veterans Flag Memorial adds to the list of sites to see in Kentucky. The Flag Memorial and exhibition located at the Kentucky Center for African American Heritage in Louisville, is a salute to the Colonel and all Veterans. The exhibition is an introduction to the Colonel’s History and showcases his military career that spanned three decades. Camp Nelson, the newly designated National Monument, helps stimulate public interest in the Civil War, Black Military History and Colonel Charles Young. The Camp was a training base for Black Soldiers in the Union Army. The trio of activities offers the ideal opportunity for the institutions to cooperate in developing a storyline to encourage visitations to the next location where the history is continued. From the cabin, a drive toward the Ohio Border leads to Ripley where he received his formal education. He established his permanent residence as an adult further up the road in Wilberforce, Ohio. 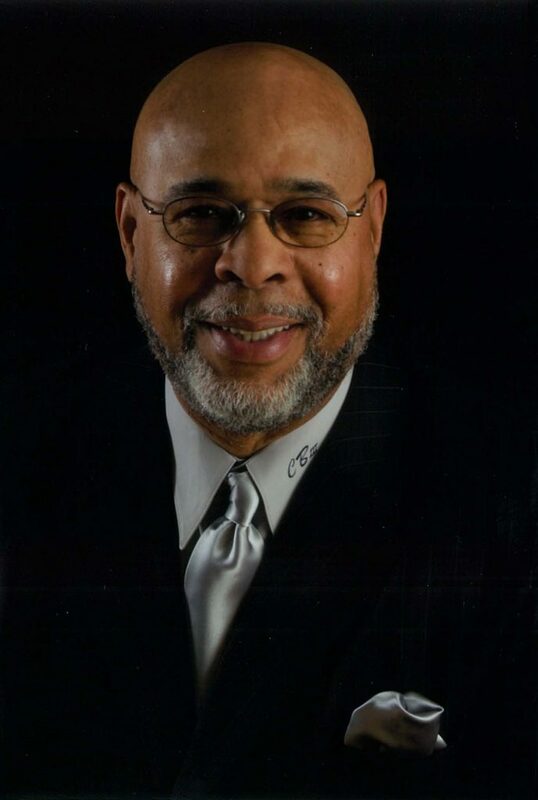 His home, donated by the Omega Psi Phi Fraternity, was designated a National Monument by past President Barack Obama. Wilberforce is also the home of the National Afro American Museum where Colonel Young’s history is archived. The road carries you from the beginning to the middle and end of the Colonel’s life. It’s a journey well worth a few days of vacation or a weekend excursion. We have called on the State of Ohio to join the regional salute. We ask they designate the highway from the Kentucky border to Wilberforce the extension of the “Colonel Charles Young Corridor.” We have requested an honorary promotion for the Colonel through the Ohio State Militia. Again, the verdict is out on the request. 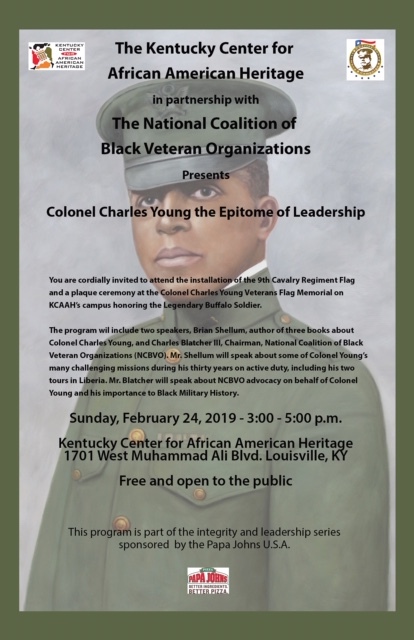 The National Coalition of Black Veteran Organizations will make a presentation of a 9th Cavalry Regiment Flag to the Kentucky Center for African American Heritage on February 24, 2019 in a public ceremony. The Center is located at 1701 Muhammad Ali Blvd in Louisville, Kentucky. The program will begin at 3:00 p.m. The Center is hosting the event as a part of its Black History Month celebration. In closing, we are encouraging public support for cultural institutions and projects promoting the preservation of Black Military History in commemoration of Black History Month. We can not over stress the importance of supporting the few remaining institutions and projects. Your donation to either or all the following would be appreciated. We offer you the names and addresses to save you time in making your donation.